Barcelona’s fixture against Atletico Madrid was a must-win for the Catalan side if they were to maintain pressure on league leaders, Real Madrid. However, the hosts still hold dreams of a late title push, however implausible. Diego Simeone’s men cranked up the pressure right from kick off and pushed Barcelona deep into their own half for much of the game. Despite their dominance, it was Barcelona who took the lead through a very fortuitous goal from Rafinha, who was the fastest to react to a loose ball inside the area. Atletico equalised just minutes later through a set piece which was headed in by Diego Godin. Just when it seemed like the match was about to end in a stalemate, Lionel Messi – who was invisible for much of the night – made the difference. 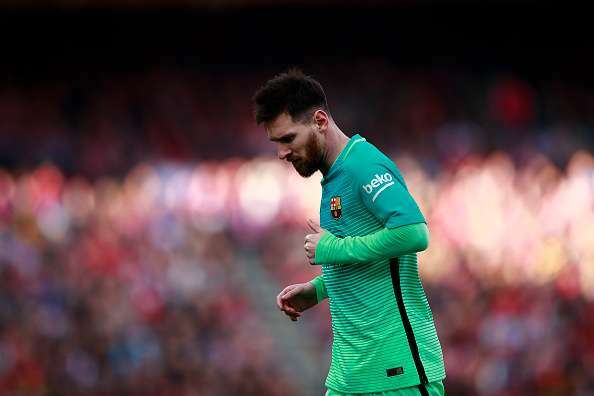 The Argentine scored in the 86th minute to seal their victory in what was perhaps their final game at the Vicente Calderon. Oblak was not tested as much as ter Stegen in the Barcelona goal, and most of Barcelona’s attempts were off the mark. A competent showing from the Slovenian was first marred by Rafinha’s goal, followed by Messi’s towards the end of the second half. Even though he made four saves, the 24-year-old just wasn’t quick enough to react on time and salvage a win or even a point for his side. Stefan Savic became an increasingly busy man as the game wore on and was put under pressure by Barcelona. The Montenegrin made four clearances and blocked three of the opposition’s attempts to create a goalscoring opportunity. Three interceptions and a couple of tackles were the standout moments for the 26-year-old. He wasn’t dispossessed even once and looked solid for most of the night. Diego Godin was quite a threat to the Catalan club going forward as he missed a shot on goal in the first half. He seemed to have salvaged a point for his side when he scored with a header in the 70th minute but it wasn’t meant to be. The Uruguayan broke free from the defenders near him and sent the ball sailing in between ter Stegen’s outstretched hands. He looked confident at the back as well making 12 clearances and winning 12 of his 16 duels with the opposition. Sime Vrsaljko’s night was never going to be easy with Neymar to contend with on the right flank. The Brazilian made a nuisance of himself and ran circles around the Croatian and intercepted a handful of his passes. The right-back had a disappointing game as he could never quite pin down Neymar and was outrun by him on a couple of occasions. The 25-year-old looked out of his depth as he gave way to the Barcelona players much too easily. Filipe Luis’s work rate on the left flank was quite impressive, giving his teammates added depth to their attack. Teaming up with Carrasco in the wing, he delivered some promising crosses around the penalty area to give the likes of Gameiro and Griezmann plenty of opportunity to attack. Accurate passing coupled with his confidence on the ball was a bonus for Atletico Madrid as they looked the better team for much of the game. Koke’s biggest contribution of the night was the free kick that led to Godin’s goal. Taken from near the byline on the right, his delivery was just the right height for the Uruguayan to make the most of. The Spanish midfielder picked out a few key passes that sent his teammates through on goal but failed to make much else of his night. Gabi was all over the centre of the park, ensuring Barcelona weren’t allowed to take control of the game. He was quick to take the ball off the opposition and send his teammates on the attack. The Spaniard did make a couple of foolish fouls and was lucky not to be penalised any further than the yellow card he received. His accurate passing went a long way in giving Madrid the ascendancy for long periods in the game. Saul provided defensive cover ahead of his back four quite competently and found himself all over the pitch, lending a hand wherever required. His contribution proved to be especially vital because of the high line maintained by Diego Simeone’s men. He was quick to keep the ball moving and created a goalscoring opportunity that unfortunately came to no avail. Yannick Carrasco was a livewire down the left as he exploited Sergi Roberto on a number of occasions. Quick to react and nimble on his feet, the 23-year-old had a couple of his attempts on goal go wide. He saw one of his shots saved by Ter Stegen as well. While his moments both on and off the ball was impressive, he made very little of his opportunities and saw his side lose out on points from failure to convert. Kevin Gameiro was a real threat to Barcelona around the penalty area as he was always on hand to attack any delivery that came his way. Staying in position for most of the night, he ventured into his own half on just a couple of occasions. 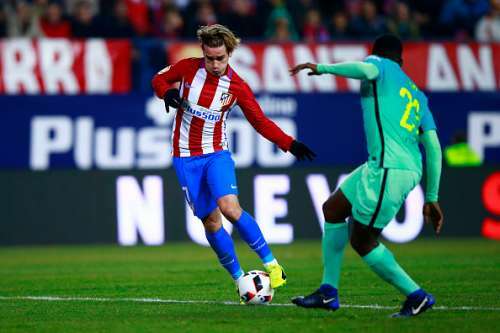 The Frenchman was eventually substituted in the 72nd minute in favour of Angel Correa. In spite of his advanced position, Antoine Griezmann picked up the ball from deep inside his own half to charge forward with his teammates in midfield. He picked a handful of smart passes and recorded two shots on goal for Atletico Madrid. Fernando Torres was introduced in the 68th minute in place of Yannick Carrasco. The former Chelsea player had an opportunity to score for his side when a cross almost reached him but was somehow cleared away Gerard Pique. Angel Correa came on in the 72nd minute and found very little opportunity to go forward by the end of the game. In spite of dribbling past Barcelona defenders on one occasion, he couldn’t find a teammate to capitulate on the opportunity. Ter Stegen was Barcelona’s saviour against Atletico Madrid as he was the only thing standing between abject defeat and the hope of fighting for the league title. The German held his line under pressure and pulled off some crucial saves to keep his team in the game. Even though he let Godin’s header get past him, the three Barcelona defenders should have reacted better. Umtiti was repeatedly caught out by the pressing Atletico attackers. However, he did make a number of important blocks that proved to be vital. Stretching to make a block ahead of his keeper, he kept a fine shot from Griezmann out. Gerard Pique had to clear on a couple of occasions when Atletico Madrid were overwhelming Barcelona with waves of attack. The former Manchester United player did especially well to clear a cross late in the second half which would have otherwise landed directly in the path of Fernando Torres. Mathieu kept a lid on the attacks from the left. 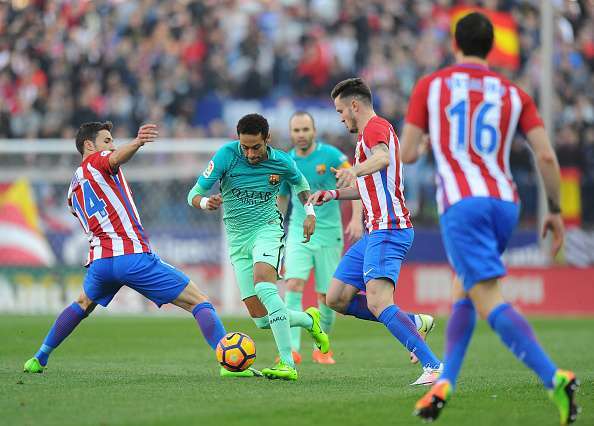 At a disadvantage against Atletico Madrid’s much faster midfielders, the Frenchman held his own and made two clearances and an interception. Playing higher up the pitch in an unconventional formation for Barcelona, Sergi Roberto struggled against Simeone’s side as he allowed Carrasco and Luis to box him into a corner on multiple occasions. However, half-time proved to be the turning point for the 25-year-old as he came back looking more confident and sure of his passing. Sergio Busquets got quite the run around at the Vicente Calderon but improved as the game progressed. While he was good at dribbling past his opponents, he didn’t fare quite as well when trying to regain possession. The midfielder made three successful tackles and intercepted a pass in the second half. Rafinha was having a terrible time and seemed to be the wrong pick for Luis Enrique until he scored the first goal of the night. After Luis Suarez released a loose ball inside the box, Rafinha was the quickest to react as he shot it past Oblak to give his team the lead. The game against Atletico Madrid is one Iniesta will want to forget soon due to his minimal involvement in the proceedings. While he failed to command the proceedings on the pitch in the first half, he improved marginally in the second. However, the Spanish World Cup winner made as few as 38 passes in the game. Lionel Messi was having an uncharacteristically poor game much like his teammate Iniesta. Playing in a much deeper and central role than he is used to, the Argentine struggled to keep possession of the ball and hold on to it to create opportunities. However, very few will remember the miserable time he was having thanks to his late goal that rescued the three points for his side. Neymar was Barcelona’s biggest threat throughout the course of the night. With two-thirds of ‘MSN’ all but absent, the Brazilian did his best to push forward and created a nuisance of himself for Vrsaljko. He dribbled well while taking on Atletico defenders and even created a decent chance for his team to score. Only he seemed to have the vision to get past the resolute Rojiblancos. Luis Suarez missed a few relatively easy chances and did his side no favours when they were under punishing pressure from Simeone’s side. The Uruguayan misfired in the first half to send his shot wide after being sent through by Messi. However, he was the provider for Rafinha’s opening goal after he managed to release the ball inside the box. Rakitic replaced Iniesta in the 61st minute in the hope of gaining a better foothold in the game. The Croatian midfielder fulfilled his duties well combining the right amount of defensive awareness and attacking forethought. Coming on for an injured Mathieu in the 77th minute, Digne did some great last-minute defending. He got in the way of an Atletico Madrid counter after Barcelona had gone 2-1 up as well. Andre Gomes came on for Sergio Roberto in an attempt to go all out and win the three points from the fixture. However, his introduction had very little do with the outcome of the game.